We would like to hear from you about your experience with BackTpack. Please email us at info@backtpack.com. 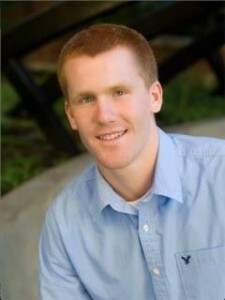 We welcome photos too! "BackTpack is very helpful because it distributes the weight evenly on both sides and helps with my back pain. I also like being able to keep my things organized. I would give it an A+." "I sure love my BackTpack and have taken it on planes, trains, automobiles, and cable cars! A great contribution to the planet!" "Both Alepo and I attended the 2018 California Council of the Blind conference and convention held on March 21st-26th, 2018 in Sacramento, California where I met Marilyn M von Foerster, PT who was promoting her BackTpack, which is actually “side-packs” that make carrying anything much easier for individuals, such as me. 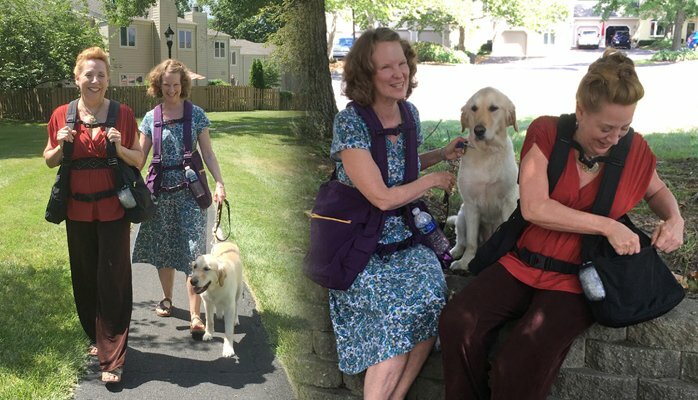 This was especially helpful for me, as I hold my canine partners harness with my left-hand and his gentle leader in my right-hand, which makes carrying things very difficult for me. But, the BackTpack takes away any hurdles and carrying becomes, so easy to accomplish. 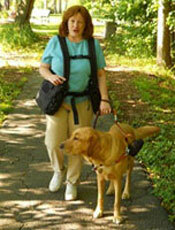 They can be especially helpful to assistance dog teams." "I've had a BackTpack for several years now and I love it! It has made my life so much easier and I take every opportunity I have to tell people about the bag and how to get one! Thank you so much for creating the bags with such a high level of quality! I cannot believe that it is showing no signs of structural wear of years of daily abuse! That is nearly unheard of in the consumer world and I just want to say that I really appreciate it!" "As a physical therapist with a specialty in ergonomics, I was quite excited to read about the BackTpack and all of the thought and effort that went in to designing such a ‘body-friendly’ product. It did not disappoint. Extremely well made, highly adjustable and so many compartments. I am able to walk from one appointment to the next with the weight of all of my equipment evenly distributed across my back and shoulders with my hands free. My physical and occupational therapist co-workers were also quite impressed and immediately began thinking of their patients (and their own children) who could benefit from the BackTpack." "My 11 year old son's daily load of 6.5 kg is a burden he no longer has to endure bent over in pain since using BackTpack. He comments constantly on the effect this incredible carrying system has had on his neck, shoulders and all round posture while negotiating this daily load to, from and during school. Thank you Marilyn and family for this amazing system. I recommend BackTpack to all parents who have their children’s well being at heart." "As parents, we wanted to try the BackTpack out for ourselves to see why our child chose the BackTpack over her standard style cartoon back pack and so we loaded it up and went out for a walk. We discovered the posture, comfort and balance she found in wearing it was in fact as fantastic as she said. We could now see using the BackTpack not only for her school but for us too at work, doctor visits, park time with our kids or pets, mall shopping, hiking, camping, events, amusement parks, flea market shopping, farmers markets, vacations, tailgating events, and even for quick bagless grocery shopping!" "My friend just pulled out the BackTpack I got her. She's loving it. Went to her doctor's and her doctor fell in love with it. I'm getting ready to do some traveling and, of course, I'm packing mine. Terrific product." The Coolest Back “T” Pack Ever! 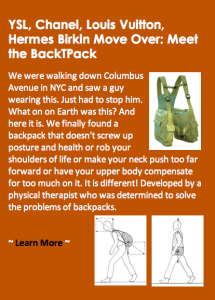 "I am a massage therapist and functional movement specialist, and saw this backpack featured on the posture restoration institute website - a modality I am studying right now. Regular backpacks always hurt my back and neck no matter how I carried them or corrected my posture. I was excited when I saw this backpack recommended by the PRI people. Theoretically, it looks like it would be great for the body - it follows all the principles I have been studying. I tried mine for the first time today and it feels wonderful. I can carry much more weight than I would in my usual backpack easily, and my neck feels GREAT. No pain at all. Furthermore, the weight of the bag bringing my shoulders down feels wonderful on my shoulders and actually has a calming effect! I wonder if it would be helpful for people who have autistic spectrum or anxiety disorders since they often benefit from pressure. In any case, one of my clients with scoliosis today tried my pack, and she loved how it felt as well, so I believe she will be ordering it soon!" "One of the big problems with riding a motorcycle long distance is back problems. So many riders use back packs. I don't unless I have no choice. I use a large tank bag or strap something on bike. Thats not a great idea as it can come off. BackTpack is the greatest! When riding I don't even know I am carrying anything. I had quite a bit in in it today and it was really comfortable. It's a real winner"
"I wear my BackTpack everywhere -- all around Arizona for work and hiking; to WV, NC, MA, CA, Australia and New Zealand. Wouldn't be without it!" "As someone who shattered her hip in a car accident years ago, I can personally attest to the amazing comfort of a BackTpack. Even when mine is stuffed full, I barely feel the weight. Love it!" "I finally was able to try out my BackTpack this week during my Doctor of Pharmacy program orientation - WOW! After years of heavy loads during my undergraduate years, as well as having spine surgery about six months ago, it was magic when I put the shoulder straps on. It felt like nothing was there! I had a lot with me too - notebooks, my planner, my laptop, a bottle of water, my pencil case and some snacks 🙂 This is a life-changing product for those who have had spine issues. I wish I knew about BackTpack when I was an undergraduate! Thank you for also assisting me with my order in deciding which bag was most appropriate for me! I am really excited to use this during pharmacy school! I cannot express how grateful I am for discovering BackTpack!" "We purchased these for our Citizen Corps volunteers to use during disaster response. They are perfect for loading supplies into while working in the field. The design is exactly what is needed to prevent back strain while wearing the pack for long periods of time. Couldn’t ask for a better product!" "I can NOT imagine life without our BackTpacks!! They have traveled with us all over Europe multiple times, on domestic travels, hikes etc. On flights they count as a personal item but I can get more in them than I can in a carry on.We love love love our BackTpacks and are still amazed that they look brand new! What an amazing product!" "This product is amazing! I have been looking for something like this since I became a white cane user over four years ago. As a blind/visually impaired person, our hands are already occupied with our guide dog and/or white cane. We have to bend a lot to care for our dogs who are our eyes as well as use our hands to “see” things. A purse or traditional backpacks are such a hazard for your back and at greater risk of theft. They are also a nuisance, sliding off your shoulder when you bend over. To be able to carry all you need at your sides and bend and stretch in active ways while being safe and convenient is priceless. Carrying toys, treats, and water for my dog…while also carrying my wallet, iPad, iPhone, keys, spare hat/shades and water for me…no longer a hassle with BackTpack. I am truly amazed and thrilled with this product." "I have only one complaint...It never wears out so I can get the latest model!" "BackTpack is awesome and I tell people all the time when I travel on the train with mine on and I don't have the huge bulky pack on my back... my things are on my sides so I can move around and sit with it all at my side. What a great invention." 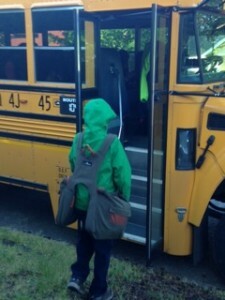 "My son was having difficulty managing his backpack, and started complaining of back and shoulder pain after school. We tried the BackTpack and he felt pain-free instantly. He reports that the BackTpack "doesn't hurt" and its design allows him to automatically turn on his posture muscles and stand straighter when he is waiting for the bus and transitioning between classes. He can carry his school binder, a cellphone, lunch and a few books without any difficulty. It's lasted over a year in middle school with no signs of excessive wear and tear. It's been a great investment in both wellness and durability." "BackTpack is perfect! It doesn't hurt my back like my other bag and it is easy to run." "More weight feels like less weight. I have no more back pain. It used to hurt when I had tons of stuff in my backpack. I can do sprints with it on. I used to have to take my backpack off to run. I like the pockets. It is something new at our school and other people want them. I stand up straight instead of slouched." "Wearing a BackTpack during my critical younger years allowed me to create healthy postural habits which I still carry with me to this day, no pun intended. BackTpack is the exemplary pack of the future as posture begins to degrade through the use of traditional backpacks. I would recommend this product to anyone as it is a simple solution to a national health crisis." "Thanks for telling us about BackTpack. Wow what a difference it has made to my back and I can keep everything safe. I do a lot of commuting on the train from my home in Traralgon to Melbourne which is about 133K's from Melbourne, a two hour train ride." "Lots of people ask me about my bag. It's a great investment in my physical well-being! Consider it for your kids or college students!" "BEFORE: After seeing a colleague's BackTpack, I decided I had to get one for myself. But which one? I could use one for my teaching work. 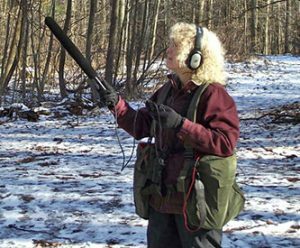 but I also thought it would work well for my work as a field naturalist who carries audio field recording gear, photography gear, and other things necessary for field work. I opted to try one for field gear first, and it is going to serve me well. I'm 5'3+1/2, small-boned and slender woman. I got the medium/large (standard size) for the field work and will probably get the slightly smaller one for more urban applications. The construction is very good, it looks great, and I am quite impressed with how it supports good body mechanics. AFTER: My new BackTpack keeps my gear evenly distributed and better balanced. It therefore allows me to keep my back straighter, reducing the neck tension and pain that I used to accept as inevitable. I especially love the ease with which I can access all of my gear, and my rather heavy camera now resides in the BackTpack instead of in a case strapped around my waist. There's plenty of room for lenses as well as my field recording equipment and other supplies." "I tried out the BackTpack today at the OTAC conference and loved it!! So comfy and felt like I wasn't carrying anything! What a brilliant alternative to my current backpack that hurts me every day!" ¡Atención ahora que hay que escoger mochila para el colegio! "Cuidar los hábitos posturales del niño no significa que tengamos que explicarle cual es la postura adecuada, en la mayoría de los casos basta con no obligarles a usar objetos que les fuerzan a tomar posturas inadecuadas." 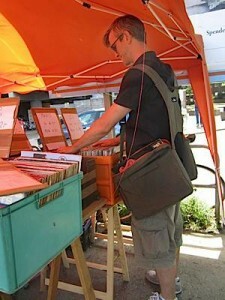 "BackTpack is perfect for record collecting! It has room to carry round 80 records on your body (perfect for gigs in bars where you cannot afford a cab). Even if it's filled, you can still sit or kneel down and dig in crates. It's handy for traveling (it qualifies as a "personal item" on airlines, so you can bring an additional carry-on). You can ride a bike without it getting in your way. I am a fan." "I love BackTpack so much! I have had my first one for six years, and after all the abuse it has taken, it was time to buy a new one. I ordered it last week, and it came very quickly. 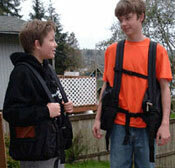 My husband and oldest son also own BackTpacks and they have been great as we all have trudged to and from school. My best friend also bought one a few years ago. I tell everyone I meet about this wonderful carrying system. I am blind and have a mobility impairment, and the BackTpack has made it very easy for me to carry my computer, water bottle, and everything else, and use my white cane effectively. The BackTpack has made it so much easier for me to be a busy student and mom. Thank you!" "Over the past 4 years I was in a couple of car accidents in which I was rear ended while at a full stop. Because of this, I have major issues with my neck and lower back. As a result, I haven't been able to handle any type of bag that I try to carry. I'm a college student and I sometimes have 40lbs worth of books to lug all day long. Shoulder bags hurt my neck and lower back, and roller bags mess with my shoulders and my gait. This past December I did some research to find an ergonomic bag for school, and I found the BackTpack. This bag is excellent! When I carry this bag I can barely even feel the weight. I have less issues with my neck and shoulders wearing this bag because of the way the straps sit farther away from my neck. There is no pain in my lower back, at all, while wearing the BackTpack, and the big plus is that I can sit in it without removing it. Although, when I do need to remove it, I can just quick fold the bag briefcase style and carry it like a suitcase. This bag has been a lifesaver for me. I thoroughly recommend it if you have back issues, if you plan to travel, or even just for light groceries. This design really makes sense. Thanks people of BackTpack!" "I was rear ended right before finals week one term and was forced to use a small rolling luggage carrier for nearly two weeks as I couldn't carry my books on my back with a regular backpack due to whiplash in my lumbar and cervical spine. Apart from the excruciating pain that caused for the first several days, it would have really interfered with my healing. Before the next term started, I ordered a BackTpack to be my new solution. In the first three weeks of the term, I had no significant pain that I could link directly to carrying my thirty pounds of books. Then I was rear ended again (I know...). After the second accident, wearing a traditional backpack is simply out of the question. With BackTpack, even after the second accident I've had none of the back pain I had come to expect from having thirty+ pounds of books on my back. I've even recommended BackTpack to my chiropractor--honestly, these packs should be in every physical therapy or chiropractic clinic in the world so that patients like me can learn about them and acquire them easily." WOU Dance Professor Endorses BackTpack! "Dancers are notorious for carrying around bulky dance bags slung over one shoulder causing them to lean to one side. 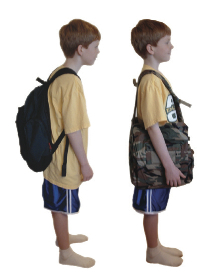 Students often load up their traditional backpacks to such an extent that they must lean forward in order to counterbalance the heavy load of books on their backs. Both of these situations cause poor alignment of the spine and can lead to chronic neck and back pain. The design of the BackTpack is the ideal solution to both of these problems because it allows the wearer to balance the load evenly between both sides of the body, which promotes proper vertical alignment of the spine. On a personal note, my children ride their bikes to school and they have found that it is more difficult to balance with traditional backpacks, which place the load high upon the back. 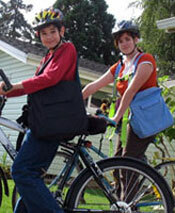 They prefer their BackTpacks because the load has a lower center of gravity and is balanced from side to side making bike riding much safer and more stable. What parent wouldn’t want that?" 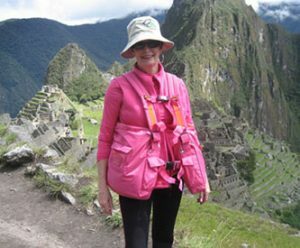 "Here is (a photo of) my mom wearing the BackTpack at Machu Picchu in Peru. She said it was so easy for her to carry while hiking and eliminated any back pains. She was hiking in comfort while my poor father used a regular pack and was pretty sore afterwards." 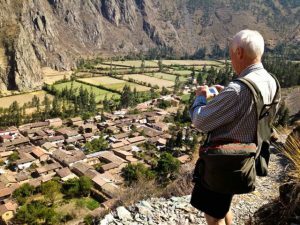 "After two poor-outcome lumbar back surgeries in four years, I found out on my own how difficult it is to carry possessions in a traditional backpack, purse, briefcase or bag. The BackTpack is just great! I can wear it in the car, keep it on when I sit, load and unload when it's on, and even carry my laptop without low back pain. I haven't had any problems with thoracic or cervical strain, and no difficulty changing positions while wearing it. I have already been talking to patients and friends about the BackTpack, because my personal experience with it has been so positive. I hope to get my four children out of their unwieldy backpacks soon, and have encouraged them to try the BackTpack." "These bags are almost indestructible, and wash well. They are rather like Birkenstock® shoes; you need to be sure you like the color when you buy them, since they take years to wear out. The current bag has survived a few purses and is in better shape still than all the purses I have junked. I use it nearly everyday. I have used one bag for Medical Examiner work for several years, and one bag for everyday use." "It's comforting to know I am not damaging my back. I love how I can sit with the pack on while I'm on my way to school." "I love how the pack feels on. My old backpack hurt my back. I also like the pockets and all the different colors are fun!" "My old backpack just weighed me down and half the time, it was resting on the back tire when I rode my bike. My backpack even got a hole where it was resting on the bike tire. It just got too hard for me to ride my bike so I stopped. With my BackTpack, I can put my binder on one side and my clarinet on the other. It's easier to pedal so I'm riding my bike to school again." "I like the BackTpack because it feels good to wear it. I love it! I love all the compartments, the color, the way it feels, the water bottle holder. With my low vision, the yellow is really bright against the purple and I get compliments on it all the time. I like the comfort, especially the padded straps. No matter how much weight you have, it still feels okay. Oh! And I can hold my cup of coffee and have an extra hand free too!" "Using my BackTpack again. Fun to pack so light and carry so easily. Thanks for your work for healthy strong backs." "I have had a BackTpack 4 for over three years. I bought it after I found a traditional backpack, which I had migrated to due to shoulder pain from an overly heavy purse, awkward. BackTpack allows me to stand erect. I can easily reach my wallet while in a store. I use by BackTpack on a daily basis for travel, work, and pleasure. The compartments are a generous size, allowing me to carry my latest knitting project, a tablet, a book, a folder for my next meeting, and all the contents of a traditional purse. I like that the straps can be “tucked in” and the handle snapped together for a “brief case” look once I arrive at my meeting location. I like this product so much, I just ordered a second one!" "I have used traditional backpacks my whole life. As a 24 year old, I started to become more aware of the need to protect my body from the negative effects associated with bad posture brought on from backpacks which hurt my shoulders and cause my back to hurt. After much research, I found the BackTpack, and I was amazed by the design. I have stopped using traditional backpacks altogether and have used the BackTpack on a daily basis. The design is incredible and really helps me carry my things in a much more natural fashion. Its such a versatile product, and it is a wonderful product that has really helped my shoulders and my back feel free from pain associated with regular backpacks in the marketplace. If your looking for a truly unique backpack that is actually good for your back and shoulders, this is it!" "First off, BackTpack's amazing bag design saved my back and shoulders through medical school! I recommend them to my patients who have heavy things to carry on a daily basis. They work great when bicycling and hiking, and when you hang it on the back of a chair – your books, pens, snacks and water bottles are easily accessible. Second, what a helpful emergency kit suggestion! Saving this to make up my own!" "BackTpack is great! It really does work on the posture! I felt muscles I have not felt in a while as it straightens the posture! Tons better than a back pack or purse! Very very nice design and so much better!" "It also helps with carrying heavy stuff up mountains without any back pain! I love my BackTpack!" "I constantly evaluate new products that might benefit my patients most of whom have failed prior Physical Therapy. Most products I find lacking. I stumbled upon the BackTpack and was instantly interested as it was obvious that it solved so many problems. After ordering, my initial impression was confirmed. In addition to the relief to the neck and back which is obvious, there were so many little details. They thought of everything. I love, love the way you can snap together a handle so the two sides can be carried (briefly) like a briefcase. It is so well made and sturdy, I expect it to last a lifetime (even with a teen). I will be using this on my next trip instead of my usual carry on. I have had several patients order one and they all love it. It makes so much sense, I can’t imagine anyone getting a “regular” backpack once they have seen the BackTpack. I am going to show this product every time I teach a workshop. Thank you so much for creating this. It solves a huge problem with our young people as well as for any person who carries a lot in and out of work like I do. My patients needed this and I am so glad it is available to help them." "This is in praise of BackTpacks! These innovative, corrective side packs offer freedom of movement, proper alignment of the spine when used, great diversified storage compartements etc, you can sit in your car or on an airplane, ride the bus without taking them off. You have freedom for both hands as you carry your various loads. You come back from a day at the office, hiking or shopping with no stress anywhere in your body. The weight is balanced, keeps you upright and unburdened!" "I am so excited to say that I have finally found my best friend and I have become a whole new person because of it! I stand a little straighter, feel better about myself, and my life has become a lot less stressful! After years of trial and error I have found THE one! I am proud to introduce... my BackTpack! I have finally found the right backpack! Who did you think I was talking about? A boyfriend? " "As a retired physical therapist, I give the BackTpack an A+! This postural, functional double bag is wonderful for school children, those with back pain issues, the blind, and anyone else who must use an assistive device to locomote. Senior citizens appreciate the BackTpack when going to the library where books will be exchanged and transported. This item also gets a positive response from fishermen and new mothers! Anatomically, posture is critical to our health, and the BackTpack reinforces the spine’s natural 3 curves. The BackTpack is well made and undergoing wonderful upgrades, because the brilliant family who created the BackTpack really listens to YOU, a rarity in today’s environment. Finally, the price is right, since you are getting 2 well-made bags for the price of one! I strongly recommend the BackTpack." "Awesomeeeeeeeeeeeeeeeeeeeeeeeeee! What a great product!" 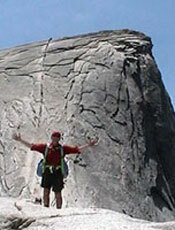 "Having gone on long hikes with BackTpack, I can categorically state that this is the way to go hiking! From @4,000 feet up to 10,000 on a multiday trip, no problem. Traveling to Europe from the left coast, no problem. Glad I bought one of these many years ago!" "After wearing my BackTpack, I will never wear a regular backpack again. After two years it shows minimal wear and tear, and I have used it every day. I have used it for my mile-long walk to work, for travel to art lessons, and as my only luggage on plane trips. I love it!" "My husband and I are each officially the proud owners of one BackTpack 4 apiece. Tim has a black khaki and I have a violet mango. They're very easy to put on as well as to adjust. They are very comfortable and allow one to put belongings in very convenient places without even needing to remove the pack from the body to access them. Not only are there enough pockets, but I have a few gadgets with belt clips, and the pack has enough straps so I can clip the gadgets to my body without the need for a belt. Thank you for creating the ideal pack to accommodate all of my needs." "The unique design of the BackTpack distributes the weight of the contents perfectly between the shoulders and pelvis. Unlike other backpacks which can place their weight on the upper back or unevenly on the torso, the BackTpack facilitates upright posture of the user and supports ease of movement. It is highly recommended for people who have back or posture issues due to low muscle tone." "I have taken my BackTpack up Middle Sister on a multi-day hike....easiest hike I have ever had! Took it to Europe (love the ability to make two bags into one) A very handy bag and well worth the purchase price." "We were walking down Columbus Avenue in NYC and saw a guy wearing this (BackTpack). Just had to stop him. What on on Earth was this? And here it is. We finally found a backpack that doesn't screw up posture and health or rob your shoulders of life or make your neck push too far forward or have your upper body compensate for too much on it. It is different! 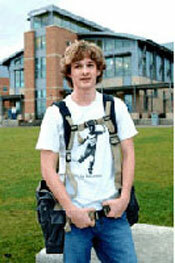 Developed by a physical therapist who was determined to solve the problems of backpacks." "My daughter has been having back problems for several years from carrying her standard backpack to school. Her pain had escalated to the point that we were making weekly visits to the chiropractor and she was taking nightly pain medication so she could sleep. I found the BackTpack and decided to try it. It works wonders. Her posture has straightened since she no longer has to bend forward in order to balance the weight and her pain disappeared within the first week." "I injured my neck just before leaving for a trip of a lifetime with my son to visit where I served in the Peace Corps 45 years ago! I would have had to cancel the trip if it weren't for the hip loading feature of the BackTpack and the design of the bag which allowed access to items without needing to take the bag on and off. I had no weight and no pain in my neck and shoulders due to the hip loading belt, and was still able to carry the load I needed. We had a wonderful time!!" "Congratulations on getting on national TV on the Today Show and get all that publicity. BackTpack is awesome and I tell people all the time when I travel on the train with mine on and I don't have the huge bulky pack on my back... my things are on my sides so I can move around and sit with it all at my side. What a great invention." "This is the most amazing load carrying system ever invented. All my back and neck problems disappeared within 2 days of using it, and as a student carrying many pounds of books it has been a literal lifesaver for me. Every student should have one, as well as anyone who carries any kind of weight for any reason. I cannot imagine being without one now. Do yourself a favor and get one, your back, neck and body will thank you every day. I wish I had this back when I was hiking the deserts of the southwest, I would not have suffered the decades of back and neck pain I have endured if I had. Thank you so much BackTpack and God bless all of you." "Loving my new BackTPack that I found under my Christmas tree. Thanks for getting it here in time! A great product and personal service, can't ask for anything more." 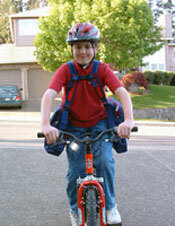 "Grandma gave our seventh grade son a BackTpack for Christmas and I am so thankful. Three years later, he still loves it and it looks barely broken in. His back feels better and he likes that he can sit down and leave it on. It is easier to ride his bike without the shifting weight of a backpack. He even likes the color! The quality is terrific. We used to have to buy more than one pack a year. All that AND their customer service is professional, warm and helpful. It has the sturdiness and back-saving features I want for my son. Our chiropractor also loves the benefits of the BackTpack. We are customers for life. Thanks for an excellent product!" "I really liked using BackTpack. I hauled about ten books to the abbey when I went for my writing retreat, then went hiking there with a friend and carried both of our stuff including our waterbottles and notebooks. Both of us were writing hiking articles. I had no trouble at all, while my friend struggled with her over-heavy handbag and at one point even fell down... I think her load made her lopsided." "I purchased this to use as a book bag for college. I carry a heavy load and walk across campus five days a week and my back was starting to feel it. I did a lot of research for a bag that would help with back fatigue. "Ergonomic" backpacks seem to only shift weight around on your back & if you're lucky they add a little padding in there too. This is completely different. 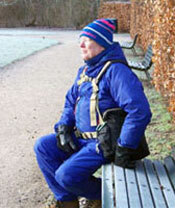 I never felt back fatigue, the shoulder straps do not cut into my shoulders - even with a heavy load. I can get to anything with it on, which is awesome! I don't have to take the bag off to get to stuff. It has everything a book bag has and more. It has every pocket size you will possibly need and those pockets are easy to get to. I never tried it on a bike or while hiking, but I can see how this would be perfect for those activities. It puts your center of gravity at your hips and does not impede your range of motion at all. Again, you have access to bag contents without taking it off. I would recommend splurging and getting the additional chest strap if you are doing these activities. Note - it will take a little getting used to. It's different than a traditional book bag or back pack to put it on and take it off. Remember: you won't be doing that as often with this bag as a regular book bag/backpack. It's different than other bags, but that is why you are looking at it. The construction is top-notch. It reminds me of the high-end, light-weight photographers bags. There wasn't a loose stitch or hanging thread anywhere. If the bag did get scratched or ripped, I don't think it would fray apart. I totally recommend this bag for anyone." 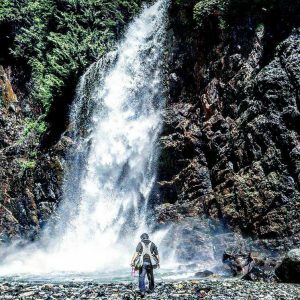 "After I had been wearing my BackTpack for several months, I tried on my old conventional backpack to see if I'd feel a difference...and did I ever! I never realized how uncomfortable a regular backpack is until I had the BackTpack." "I suffer from mild scoliosis, and years of wearing conventional backpacks and shoulder/tote bags continued to move my body in this ill direction. The BackTpack is groundbreaking because it doesn't cause alignment problems to worsen like an average bag would. It frees your shoulders, neck, and spine in a way no other bag can!" "I have used a BackTpack everyday for several years now. It's worn out now and I've just ordered a new one. I had two bulged disks and arthritis in my spine AND fibromyalgia (and serious hand issues so I can't use a rolling backpack); the BackTpack has been a big factor in allowing me the mobility to deal with graduate school. I'm now in the process of getting a PhD in musicology (music history and literature). Carrying large format books and musical scores around a large campus is a daily part of life. With a conventional backpack, my arms and hands would go numb from my thoracic outlets being squeezed, and my back would be in incredible pain. I have absolutely no problems with the BackTpack. Thanks for such an innovative product!" 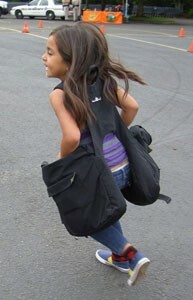 "My daughter has been having back problems for several years from carrying her standard backpack to school. Her pain had escalated to the point that we were making weekly visits to the chiropractor and she was taking nightly pain medication so she could sleep. I found the BackTpack and decided to try it. It works wonders. Her posture has straightened since she no longer has to bend forward in order to balance the weight and her pain disappeared within the first week. She did have some muscle soreness from adjusting to the new pack, but that disappeared within a couple of days. She likes having her things at her side instead of on her back and the pack is easy to get on and off. She just grabs the briefcase handles to sling the BackTpack around. Although the price of the BackTpack is more than a standard backpack it is well worth it. I would highly recommend the BackTpack for anyone, back problems or not." "I received my BackTpack by mail yesterday. I loaded it with library books this morning and took off over very uneven, icy trails across about 10 blocks of parkland to my local library. Balance is superb. It is great to be able to load and unload without removing the harness and bags. It will be amazing at the farmer's market. This is, perhaps, the best idea in packs in many decades. Great idea, well executed. My grandchildren will be getting BackTpacks for school use, as they need them, over the next few years." "We are back from Copenhagen where we spent Christmas and New Years. I used this pack daily for 10 days and carried each day a large bottle of water in each side plus what ever else I needed for the day. I didn't take off the pack at all for at least 8 hours each day. You can see that I was bundled up with 5 layers of clothing because the temp was about 25F with the wind chill running about 17F. I could sit easily without removing the pack. I was amazed at the ease of carrying a moderate "load" one would expect to have on vacation. I can assure you that you will never have a customer any happier with your product than I am. It was wonderful not to have to take a day pack off every time I sat down. We rode city busses, subways and commuter trains hundreds of times and it was great to have the comfort and luxury of leaving the BackTpack on. Thanks again for a great product. Bravo BackTpack." "Our hike for the day was 19 miles and I was very pleased that I chose this pack over the traditional backpack/day-pack. I was able to carry my trail-food, water bottles, water filter, first aid kit, camcorder, and still have room for my clothing layers as I donned or doffed them. I had inner enclosed pockets to keep my keys and ID in a safe place. The saddle bags were sinched nicely against my body so there wasn't any undesirable loose swaying of the packs and to my surprise the packs did not interfere with my normal arm swing. I was able to retrieve my own water bottles to hydrate while I continued to walk. I avoided having thoracic burning pain that I would normally get from hunching over when wearing a traditional backpack. I also was a lot less sweaty in my upper back by having that area "exposed" instead of being under a backpack. I felt the BackTpack was far superior to the traditional day-pack and I plan to wear it on my next two summer day hikes this season." "When I used the conventional backpack, I experienced back pain frequently, and was always overloading my backpack with books and binders. Within the first three days of using the BackTpack, my back pain was almost entirely gone, and has since completely disappeared. I can also carry the same amount, without walking around hunched over. I would recommend the BackTpack to everyone, especially to those experiencing any sort of back pain." "I got your product from someone who had bought a number to resell. I've had it since mid June and have to say that it's an incredible product! I have arthritis and deteriorative disk disease in my neck and upper spine, C6 through T4. This came about as a result of carrying heavy computer bags and other equipment improperly. This pack allows me to carry all of my stuff easily and end the day with little to no pain at all. Any pain is a result of other activities. I've taken the pack to trade shows where I am carrying equipment, at times heavy equipment, in it and have had no issues with my neck and upper spine as a result. I love the many compartments too! I've received zillions of comments when I fly about this pack from flight crews. Now I know where to tell them to get it! I also work with a guide dog, this means that not every pack is going to work because in my left hand, I hold the harness handle. I'm sure you have heard from many guide dog handlers about the problems we have with our necks, shoulders and so forth, and finding a proper bag that looks good and works well is hard. Well, I know I've found my carrying system in your product! Thanks for doing such a great job with it." 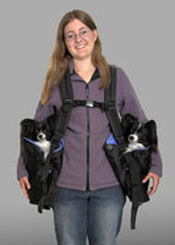 "Stephanie, 16, is very happy using the BackTpack for school and for carrying two Papillon dogs weighing 5 pounds each."